A new chapter appears every Tuesday. This week is Chapter Forty-Seven. Listen to the audio version at Nobilis Erotica here! Luke played the ancient song, the first time he’d played it since that day so long ago. It hung in the chill air like the baying of a hound. It was not the happy song he once thought. It was enthusiastic, exciting, but for no wholesome reason. It was a call to arms, an invitation to rabid violence. It was the kind of song felt bone deep, an inevitable, terrible melody recognized by all who heard it because it hibernated in the deep reservoirs of human ancestral memory, burned into the minds and souls of those who had it ringing in their ears as they died. It was an old song about old blood. Luke understood now how right his mother and the teacher had been to be frightened when a six-year-old in Texas drew that song out of thin air and a cheap child’s violin. He came down off the porch and into the yard, still playing. The chupacabras drew out of the hedges, out of the rosebushes, and stalked around him, black eyes gleaming. The collared one followed at his heels, trembling like a greyhound before a race, and began to dance with terrible leaps and scrapes and howls as it shadowboxed an unseen foe. One by one the other chupacabras joined in, their knobbed, fleshy bodies writhing in a circle around him. The satyr danced too, his cloven hooves twisting the grass and gravel. His body knew the dance, a Wild Hunt dance, a maenad kind of dance. Shadows closed in around them, growing from dark corners and crevices. First they swept across the lawn, pale patches of dark, drifting nearer and farther like a comet’s irregular orbit, but they couldn’t escape. They drew in, spinning faster and faster, growing dark and turgid, mixing among the chupacabras like black smoke. The Wild Hunt reached toward them through the thin veil between worlds. Bridge trolls, Luke thought, willing the thought through the pipes, through the song, to the chupacabras, to the gathering Wild Hunt. Our quarry is the bridge trolls drawing on the portals, he thought. All the portals, all around the world–no more tolls, no more sacrifices. The portals would be free, bathed in the blood of any troll that tried to draw upon unwary travelers. The song ended, and the sudden silence was jarring, like the ringing in his ears after a gunshot. The chupacabras scattered in all directions; released from the circle, they were surprisingly fast, as if the song had been a chain that held them to Luke. For a moment he could see one or two of them rushing pell-mell across the land, and the shadows went with them. Then they were all of them gone, leaving him in the center of Sally’s lawn, the earth and gravel churned around him in a terrible sort of fae ring. And his mother was there. She got out of her car and stood staring at him, her long gray hair blowing around her face in the cold wind. She wore a familiar expression. She stopped at the edge of the ring and stuck her hands in the pocket of her jacket, looking small and old and afraid. “Not as much as you’d think.” He picked his way across the upturned ground. He touched his forehead gently to hers, a gesture she had long ago accepted from him as affectionate, in a caprine way. She held on to his elbow as they went to the porch to rejoin Orson and Sally, two more beings she both feared and loved. Luke wondered who was supporting whom. Orson was helping a glassy-eyed Alan down the porch steps. “Hi, Mrs. Shepherdson,” he said, as if he were still one of Luke’s many teenage friends who had felt quite at home in the Shepherdson house (and refrigerator). Sally motioned them into the house, holding her mother’s first aid kit, a repurposed laundry detergent bucket from the bulk supply store. Luke sat down on the floral couch, and his mother and girlfriend set to fixing him up. “Mom, you remember Sally…?” Luke said. Agatha Shepherdson made a rude sound. “Do I remember Sally indeed. Sally honey, how are things going?” It was a loaded question, its tone heavy with meaning. Luke said nothing but couldn’t help letting a hint of a smile pull at his mouth. Life seemed to take shape while he wasn’t paying attention. Sally sat next to him, close to him, on the couch and held his hand while his mother bandaged his chupacabra wound. Sootie, the long-in-hiding blue heeler, emerged from the bedroom. Apparently the friendly voices and lack of gunfire had convinced her it was safe. She hopped up on the couch and snuggled next to Sally, casting forlorn eyes up at Luke. “No, I don’t forgive you either,” said Luke. “Don’t give Sootie grief,” Sally said, hugging the dog. “She’s had a hard day.” Sootie rolled onto her back in Sally’s lap. Luke thought about the dead bridge troll Cormick or Allison had shot, his body still in the yard. He thought about Alan, having lost his immortal self to Cuchulainn’s spear. The remaining troll, theoretically still alive in the barn with the myth-folk he’d imprisoned, and Brent, and Glen. He thought about Mae, who in the trolls’ possession had become a crumpled, perverted version of what she really was, and Orson, who’d had to see her like that, be enthralled by her magic in that state. August, who’d also endured the nymph’s magic, who’d been possessed by the troll’s magic, who had done all kinds of things under their influence, lost his horse, and had the black magic sucked out of him by Charlie. And Charlie, who had endured much for Sally, and would probably endure more before it was all over… where did Charlie fit into it? He’d been brave so far, especially for one in his first life. Luke squeezed Sally’s hand. He was glad Sally had not endured worse. “Stay by me till all this is done?” he said. Prefer reading on paper? You can mail order the paperback of Capricious, right now, and have it within days! Order from Amazon, or purchase straight from Createspace! About the author: Julie Cox is the author of Chasing Tail and numerous short stories in Circlet Press erotica anthologies. She lives in Texas with her husband, children, and ever-expanding menagerie of animals on their farm. She runs a small online yarn business and teaches yarn spinning. She has numerous stories published with Circlet Press and elsewhere. 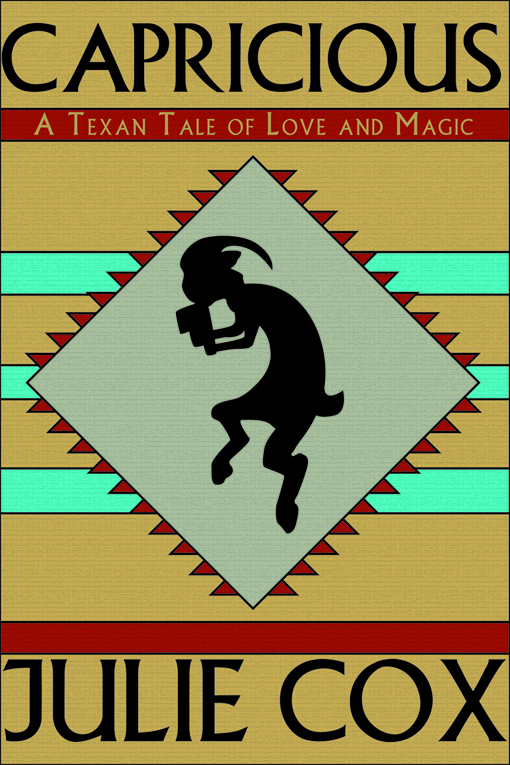 Welcome to Fox Pass, Texas, a small community where the mythical creatures aren’t so mythical after all. Satyr Luke’s comfortable routine is thrown into disarray when he becomes the target of enemies who won’t hesitate to hurt his friends to get to him. Struggling to save his town—and to sort out his feelings for his friend Sally—Luke faces the adventure of a lifetime in Julie Cox’s Capricious.